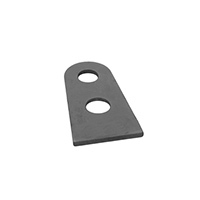 This is the outer tab for the dragster brake handle mount assembly M-148-I. The 4130 steel tab has a 7/16" dia hole and is 2" from the center of the hole to the flat weld edge. There is also a 1/2" hole 1" down. The base width of the tab is 1 1/2" and the thickness is 1/8".